During the Star Wars frenzy of 1978 I became enamoured with an entirely different film. One no less successful but one that spoke to me more with its intelligent themes, craftsmanship and ambiguity. Although still in short trousers, I was fascinated that such a weird, meandering but ultimately beautiful film could be audacious enough to market itself as a commercial feature – and yet still succeed. 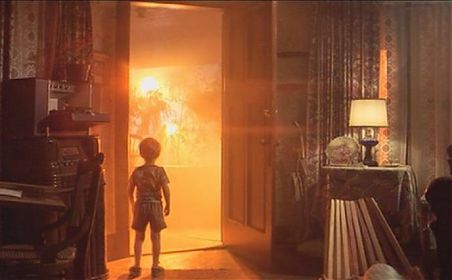 Whilst George Lucas’ epics have remained for me shallowly juvenile, Steven Spielberg’s Close Encounters of the Third kind has stayed in my memory reel for reel. Discovering it again thirty years on, I’ve found its impact no less dimmed than when I first saw it. On its release Star Wars brought science fiction back into the mainstream, although over the next few years I was already savouring things more cerebral. Re-released in the late 70s, Kubrick’s 2001: A Space Odyssey took my imagination to task. But whilst this has remained another enduring favourite the film has dated quite considerably, mostly in its obviously 60s ethos. 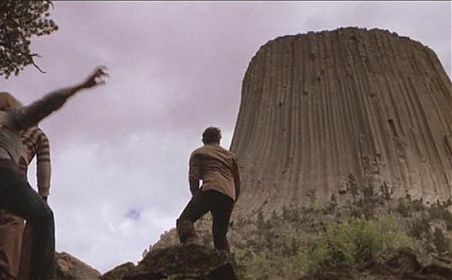 2001 is barely 10 years older than Close Encounters but it belongs to a different era entirely, left behind by Spielberg’s film as much as the fighting apemen were by HAL. Perhaps Kubrick’s mistake was in attempting to create a future that is no longer futuristic because it’s already passing us by; Spielberg settles with examining the present. 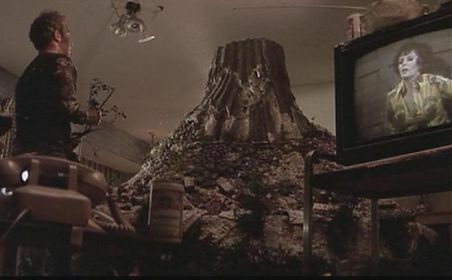 Where sci fi usually suffers by the effect of time, Close Encounters manages to bypass this failing. Richard Dreyfuss is the star of Close Encounters and delivers one of the all time 70s lead roles. 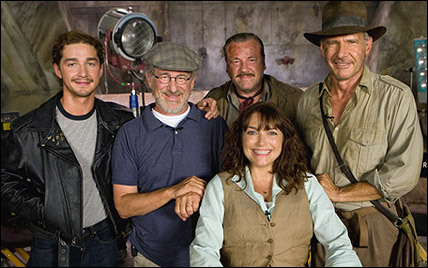 Allegedly Dreyfuss actively pursued Spielberg for the part, and it is unlikely that the original actors courted for the role (who included Steve McQueen, Dustin Hoffman and Jack Nicholson) would have been as good. Hoffman would have been too offbeat, Jack too crazy and McQueen I can’t imagine playing a character with any failings at all. Richard Dreyfuss is driven, manic and, for his family, terrifyingly obsessed after a UFO sighting. However he reigns in his performance enough to keep it subtle and compelling. Dreyfuss plays Roy Neary, an ordinary guy who, for reasons remaining mostly obscure, becomes a chosen one. His mounting mania is focused on a mountain-shaped object he cannot erase from his consciousness, manifested in every day objects and eventually engulfing him and isolating him from his family forever. 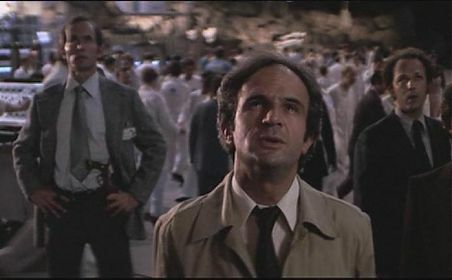 François Truffaut plays Claude Lacombe, a French scientist also preoccupied with the UFO phenomenon. Whilst an odd choice for a major role in a Hollywood movie, Truffaut’s casting speaks volumes for a film exploring the failings of human communication. The communication theme is one that works on a subtle level, giving this film a very literary quality. Close Encounters forever invites the viewer to make a connection between its various threads. The need for Lacombe to use a translator as he slips between English and French, Neary’s inability to communicate or be communicated with (his employers call to relay the message that he has lost his job, although they don’t want to speak to him directly), and the long journey to the solution of using music instead of language to talk to the aliens. Many of these ideas suggest that Man might need to get to grips with talking to himself before he turns to alien life. Technology has an odd place in this film too. Neary unsuccessfully attempts to help his son with his homework by demonstrating with a train set (neatly foreshadowing the train wreck the authorities later use as a cover up), and toys play a big part throughout; in a key scene a five year old child is memorably mesmerised by his toys coming alive at night. But whilst they toy with it, the aliens often eschew technology, attempting to arrange a rendezvous by relying largely on good old fashioned map coordinates and the even more impressive technique of thought transference. Spielberg’s genius, however, is not too make this incredibly deep film too taxing for the younger audience. 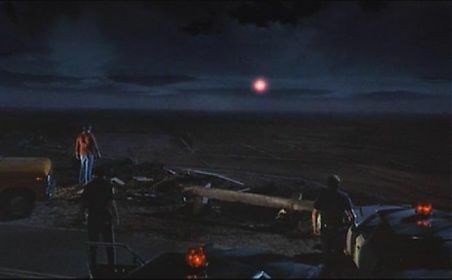 The scene where the child is abducted is one of the best sequences he has ever directed, which simply and perfectly contrasts the awe, excitement and wonder of an extra terrestrial encounter with the equally tangible fear of what it might bring. As young Barry (Cary Guffey) wants to open every door and stare at the bright lights outside, his mother is desperate to slam them and lock them both tight inside the house. Neary’s first encounter with the aliens is also memorable, which builds up perfectly to a police car chase. The special effects haven’t aged in the slightest, and the famous end sequence with the alien “mothership” has lost none of its brilliance and, like most of the film, is effective on an emotional as well as intellectual level. 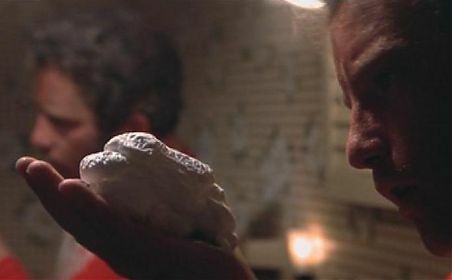 Close Encounters is full of Spielberg motifs. Neary is the driven man who isolates his wife (played by Teri Garr) from his world, recalling the similarly narrowly focused Chief Brody in Jaws. Noisy families compete to be heard amongst the domestic chaos, explored even more fully in the later ET; as always Spielberg proves to be an excellent director of children. There’s also a couple of subtle visual nods to George Pal’s War of the Worlds throughout the film, and years later he couldn’t resist going the whole hog and remaking the whole thing entirely. 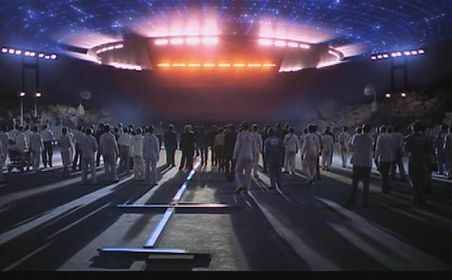 But Close Encounters remains one of Spielberg’s most personal and accomplished films. Footnote: Steven Spielberg messed around with his masterpiece somewhat. 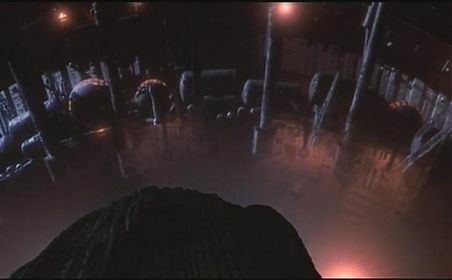 A few years later he released a Special Edition showing the interior of the alien “mothership”. He later decided this was a mistake, and removed the new scenes for a later definitive Collector’s Edition. This is very much the director’s cut that Spielberg now wants us to enjoy.